The sequences are automatically associated with structures in Chimera. Associated structures are not required, but association enables useful sequence-structure crosstalk such as bidirectional selection. Measures of sequence conservation and spatial variability can be shown as headers above the sequences, and sequence feature annotations from UniProt and the Conserved Domain Database (CDD) can be shown as colored boxes. An interface to Modeller allows comparative (homology) modeling using a template structure, as well as building missing segments without a template. Multalign Viewer status and alignment data, but not preference settings, are included in saved sessions. Tools for integrated sequence-structure analysis with UCSF Chimera. Meng EC, Pettersen EF, Couch GS, Huang CC, Ferrin TE. BMC Bioinformatics. 2006 Jul 12;7:339. There are several ways to start Multalign Viewer, a tool in the Sequence category. Explicitly starting Multalign Viewer brings up a dialog for opening a sequence alignment. In fact, simply opening a file in any of the registered sequence alignment formats (without starting Multalign Viewer first) will automatically use it to show the alignment. Several alignments can be open at the same time, each in a separate sequence window. The figure shows part of the sequence window contents for the input file apoex.fa. In addition to the sequences and their names, numbering and header lines may be displayed. Font size, sequence wrapping behavior, and the coloring of residue one-letter codes can be controlled in the Appearance preferences. Colored boxes enclosing one or more residues are called alignment regions; double-clicking a region opens the Region Browser. The Edit menu allows searching for a string or pattern of residues in the sequences, or by full or partial sequence name. When the mouse focus is in the sequence window, the Page Down key (or space) moves the view down to start with the block below the topmost block whose beginning is currently visible; Page Up (or Shift-space) moves the view up to start with the block above the topmost block whose beginning is currently visible. Vertical alignment scrolling can also be done with the mouse wheel. Mousing over sequence names and residues shows information near the bottom of the window. Mousing over a sequence name reports any associated structure(s), the vertical position in the alignment (sequence is Nth of M sequences), and sequence length. Mousing over a residue symbol reports the corresponding residue in associated structure(s), if any, otherwise the sequence position. Reporting the position in non-structure-associated sequences is turned off for larger alignments (>250,000 characters). The system “copy” shortcut (for example, command-C on Mac) will copy the contents of the active region, if any, otherwise the entire sequence(s), into the text buffer. The Hide button closes the sequence window without changing the state of Multalign Viewer. The sequence window can be reinvoked using the Raise option for the Multalign Viewer instance in the Tools menu (abbreviated MAV). This is also useful when the window has become obscured by other windows. Help opens this manual page in a browser window, and Quit exits from Multalign Viewer. Initial sequence names are taken from the input file or based on the corresponding structure chain. A sequence name can be changed by choosing Edit... Edit Sequence Name from the Multalign Viewer menu, and in the resulting dialog, indicating the desired sequence and entering a new name. Double-clicking a name in the sequence window brings up the same dialog, already set to that sequence. Edit... Find Sequence Name allows searching by full or partial sequence name. In the sequence window, ellipses (...) are used to shorten names longer than the maximum (default 30 characters) specified in the Appearance section of the Multalign Viewer preferences. Numbering can be displayed over the alignment and to the left and/or right of the sequences. Numbering displays can be controlled with the Numberings menu. Alignment numbering (for the alignment as a whole) includes gap positions and always starts at 1. Whether it should be shown initially can be set in the the Headers preferences. When present, alignment numbering is shown above any headers. Sequence start numbers can be changed arbitrarily with Numberings... Adjust Sequence Numberings. Even with a correct start number, however, a sequence's numbering will be incorrect following any missing internal residues (for example, in a sequence derived from a structure missing a loop). When an alignment is saved, /N–M can be appended to each sequence name, where N is the sequence's start number and M is calculated from N and the total number of residues in the sequence. Headers are lines of information above the sequences in the sequence window. They can be hidden/shown with the checkboxes in the Multalign Viewer Headers menu. Some headers are available automatically, and custom headers can be defined using a simple format. The Headers preferences control how Consensus and Conservation header values are calculated. However, the original values (not those used for histogram display) are assigned as residue attributes and written out when header contents are saved. Headers may be dynamic, with values that update automatically when independent variables such as the sequence alignment or structure associations are changed, or static, with values that stay the same. Static headers can be added by reading in a header definition file with Headers... Load in the Multalign Viewer menu. Loading values for a header with the same name as an existing header will create an additional header line, not replace the values in the existing header line. GC (Generic per-Column) annotations in alignments in Stockholm format are also treated as static headers. Dynamic headers can be defined with Python code. For examples, see the file share/MAVHeader/ChimeraExtension.py within the Chimera installation (it defines the Charge variation and RMSD headers described above). Rather than changing this file in the MAVHeader module, which might be overwritten whenever a new version of Chimera is installed, users should create an analogous file named ChimeraExtension.py in a different directory. The Tools preferences can be used to add that directory's location (the directory above it) to the places Chimera should look for extensions. Headers can be reordered (a header line is placed below the others when turned on with the Headers menu). Header line contents can be saved to a file (Headers... Save in the Multalign Viewer menu). Clicking within a header selects any structure residues associated with that column of the alignment. Values of headers are available as residue attributes named mavHeaderName in any associated structures. Numerical attributes will appear in the attribute lists of Render/Select by Attribute; character attributes will be listed only in the Select by Attribute portion. It may be necessary to Refresh the attribute menus or values in these tools to update them with any changes in Multalign Viewer header information. Alignment regions are colored boxes or outlines that enclose one or more residue symbols in the sequence window. A single region can contain any number of disjoint and/or abutting rectangular blocks. Pausing the cursor over a region (but not directly over a residue symbol) shows the region name in a pop-up balloon (see the Regions preferences), and double-clicking a region opens the Region Browser. Several actions in Multalign Viewer and other tools generate regions, and they can also be created manually. UniProt sequence feature annotations are loaded automatically as regions for sequences fetched from UniProt, and annotations from UniProt and/or the Conserved Domain Database can be added to other sequences (those already open in Chimera) using Info... UniProt/CDD Annotations. The initial display of manually created regions and those created by selection or structure association can be set in the Regions preferences. The display and colors of existing regions can be controlled with the Region Browser. Be aware that reordering the sequences will delete existing multisequence regions. A region can be created manually by dragging with the left mouse button within the sequence window. Dragging downward into the following block highlights to the end of the preceding block. Shift-dragging with the left mouse button adds to the active region. Ctrl-dragging creates a new region and makes it the active region. The active region is the region most recently created manually, clicked on in the sequence window, or designated as Active in the Region Browser. The corresponding parts of any associated structures are highlighted in the main Chimera window by becoming selected. Only one region can be active at a time. In the sequence window, the active region is indicated with a dashed outline; clicking the active region deactivates it, and clicking a different region deactivates the former active region and makes the new region active. A region with no interior color is only responsive to clicks on its borders. Where regions overlap, only the highest is responsive to clicks. The Region Browser can be opened by double-clicking a region in the sequence window or by choosing Info... Region Browser from the Multalign Viewer menu. Regions applicable to the entire alignment or to any of the individual sequences in the alignment can be listed using the pulldown menu near the top of the dialog. Regions applicable to the entire alignment include the Chimera selection and any hand-drawn regions, even if they only enclose parts of a single sequence. Regions applicable to an individual sequence include UniProt and CDD annotations and regions created by structure association. If UniProt and/or CDD annotations have been added, checkboxes under Data source allow including/excluding specific sets of regions from the listing. Clicking a row in the Region Browser highlights the line and chooses the region. More than one region can be chosen at a time, and checkbox settings specify whether Choosing in table shows all chosen regions, hides other regions, and/or makes the last chosen region the active region. If Include gaps is false, the chosen region(s) will be drawn to enclose only residues, not gap positions. Although a given region may then appear as disjoint blocks, it will still be a single region. reading a sequence coloring format (SCF) file or seqsel file (File... Load SCF/Seqsel File) generated by the program JEvTrace. The two formats are slightly different, but both contain information for coloring regions in the sequence and in any associated structures. The file reader automatically determines which format is being used. The formats are simple enough that users wishing to color residues alike in sequence and structure (for any reason) may wish to create a file manually and read it in by this route. A Newick-format tree corresponding to the alignment can be read and displayed to the left of the sequences with Tree... Load in the Multalign Viewer menu. A newly loaded tree will replace any previously shown tree. The tree can be hidden/shown with Tree... Show Tree. The sequence names in the tree must be the same as the sequence names in the alignment, and neither set of names can be a subset of the other. If the order of sequences in the tree differs from that in the alignment, a dialog will appear, requesting permission to reorder the alignment sequences for clearer display (to avoid tree branch crossings). Reordering will delete multisequence regions, although the Chimera selection region (if any) will subsequently reappear. When the tree includes branch lengths, both solid and dotted lines are used for display, with horizontal solid line lengths proportional to branch lengths. When the tree does not include branch lengths, only solid lines are used. Clicking a node in the tree makes it red and chooses it for subsequent operations. Tree... Extract Subalignment copies the sequences defined by the chosen node into a separate sequence window. The alignment of the sequences is kept exactly the same as in the full alignment, including any all-gap columns, so that the subalignment is initially the same length as the full alignment. If desired, all-gap columns can be deleted with the Edit menu. Sequences can be added, deleted, reordered, realigned, and renamed using the Multalign Viewer Edit menu. A sequence to add can be pasted as plain text, read from a file, inferred from a structure, or retrieved from UniProt along with its feature annotations. Several parameters can be adjusted to control how the new sequence is aligned with the others. Sequence reordering will delete multisequence regions, although the Chimera selection region (if any) will subsequently reappear. Gap columns can be inserted and removed using the Edit menu, and a sequence can be copied as plain text for pasting into another application window. The active region contents (if single-block) can be opened in a new sequence window with Edit... Region → New Window. Edit... Realign Sequences uses a Clustal Omega or MUSCLE web service to generate a new alignment from all of the sequences in the current alignment. Manual editing allows rearranging residues and gaps without changing the sequences. In other words, residues within a sequence cannot be created, deleted, mutated, or reordered, but gap positions can be created and deleted. Edit... Show Editing Keys in the Multalign Viewer menu brings up a dialog summarizing Ctrl-key editing functions. The active region can be moved one column at a time with Ctrl-left arrow and Ctrl-right arrow, or as far as possible in one step with Shift-Ctrl-arrow (until the active region abuts either some other residues or the end of the alignment). If the active region already abuts the alignment start or end, new columns will be created as needed to accommodate the movement. Such movements can be undone step-by-step with Ctrl-down arrow or collectively with Ctrl-Esc. Only Ctrl-key editing can be undone, not the larger-scale operations described below (sequence addition, deletion, and reordering). Such larger-scale operations clear the editing history, but otherwise all Ctrl-key editing operations are retained. A previously undone movement can be redone with Ctrl-up arrow. Undo/redo repositions residues but not the active region box, since the active region could have been changed during editing. Choosing File... Save As from the Multalign Viewer menu brings up a dialog for saving the sequence alignment to a file. It is possible to save just the active region to a file; the region may consist of disjoint sections, but each sequence (row) included must contain the same set of columns. All-gap columns (for example, arising when a region to be saved includes only a subset of the sequences) can be omitted from the output, and numbering can be appended to the sequence names. The sequence alignment formats available for saving are the same as those that can be read. An alignment saved in Stockholm format will automatically include annotations describing the secondary structure of any associated structures. The sequence window contents can also be saved as an EPS file (File... Save EPS in the Multalign Viewer menu). Apply calculates the percent identity without dismissing the dialog, while OK calculates the percent identity and dismisses the dialog. The percent identity is reported in the status area near the bottom of the sequence window and the Chimera Reply Log. Close simply dismisses the dialog, and Help opens this manual page in a browser window. Sequence feature annotations from UniProt and the Conserved Domain Database (CDD) are treated as regions that can be displayed as colored boxes in the sequence window. Sequence annotations from UniProt are present automatically for sequences fetched from UniProt, and UniProt or CDD annnotations can be added to other sequences (those already open in Chimera) using Info... UniProt/CDD Annotations. The remainder of this section refers to annotations not handled as regions. Annotations and comments associated with an alignment as a whole (as opposed to individual columns or sequences) can be viewed and edited using Edit... Alignment Annotations in the Multalign Viewer menu. Changes are not assessed for correctness. Alignment annotations are shown in the upper part of the dialog. Each has two parts, a name and a value (generally text). For example, MSF length is a possible name and 366 is a possible associated value. A new annotation can be added by clicking New, specifying a name, and then entering a value in the adjacent field. Values can have multiple lines even though only one is shown; pressing return in a value field starts a new line, but the previous information is retained. Clicking Delete and then choosing an annotation name removes the corresponding annotation. Alignment comments, shown in the lower part of the dialog, may consist of multiple lines of free-form text. Not all sequence alignment formats can accommodate annotations. Thus, saved files may not include this information or reflect any changes that have been made. Only the Stockholm format accommodates arbitrary annotations, whereas both Stockholm and RSF formats allow for comments. GF (Generic per-File) markups are interpreted as alignment annotations or comments (GF CC indicates the latter). GC (Generic per-Column) markups are treated as headers; they can be shown above the alignment and are available as residue attributes in any associated structures. GS (Generic per-Sequence) markups are not displayed by Multalign Viewer. GR (Generic per-Sequence and per-Column) markups are not displayed by Multalign Viewer, but when an alignment is saved in Stockholm format, the file will automatically include GR markup lines describing the secondary structure of any associated structures. If a sequence did not have a GR SS markup in the original input file and is associated with only one structure, another markup line with the same contents but named SS instead of Chimera_actual_SS_struct-name will also be included. When a sequence alignment and one or more structures are opened in Chimera (in any order), a structure chain will be associated automatically with a sequence in the alignment if their sequences can be aligned without too many mismatches (details...). Associations can be changed or added if the automated procedure does not give the desired result. However, when the sequence of a structure in Chimera is shown individually via the Sequence tool, the sequence and the corresponding structure chain are associated and cannot be dissociated. The names of structure-associated sequences are shown in bold over a box indicating the model-level color of the structure. 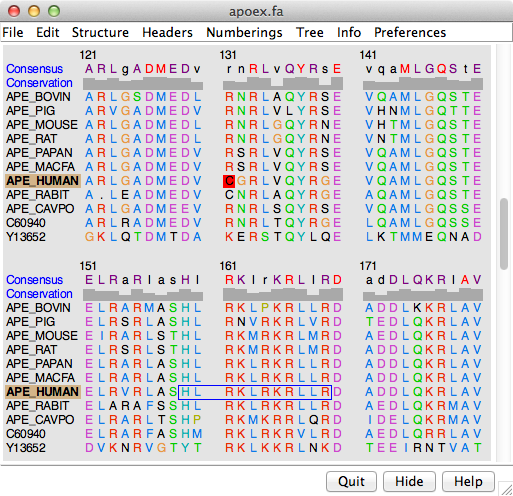 For example, APE_HUMAN in the sequence window figure is associated with a structure whose model-level color is tan. If multiple models are associated with the same sequence, the box is shown as a dark green dashed outline. Associated structure reported on mouseover. When the cursor is placed over the name of a sequence, information on the sequence and any associated structure(s) is shown in the status area near the bottom of the sequence window. When the cursor is placed over a sequence residue that is associated with a residue in one or more structures, information on the structure residue(s) is given. Association information can be saved to a file. Clicking/dragging on sequence → structure selection. When a region is made the active region (for example, when newly created by dragging), any associated structure residues will be selected. Clicking within a header line will select any structure residues associated with that column of the alignment. Structure selection → sequence region. By default, making a selection in one or more sequence-associated structures will create a region named Chimera selection in the associated sequences. Every residue with at least one atom or bond selected will be included in the region. The color of the region and whether it should be created can be controlled in the Regions preferences. The region will not be created when the selection merely reflects the current active region. Clicking with the right mouse button on a structure-associated residue in the sequence window will focus the graphics window view on the corresponding structure residue(s). Shift-right-clicking within a region (or right-clicking within the region but not on a residue) will focus the view on all of the structure residues associated with the region. When the current selection includes one or more sequence-associated residues, Structure... Expand Selection to Columns will expand the selection to include all residues associated with the same column(s) of the sequence alignment. This can be reversed with Select... Undo in the main Chimera menu. The allowable number of mismatches for automatic association is user-specified as a proportion of the total number of residues in the structure chain (1/10 by default; see the Structure preferences). For automatic association, gaps in the structure sequence relative to the sequence in the alignment file can only occur where residues are missing from the structure (for example, a flexible loop with insufficient density for coordinates to be determined). The order in which the sequence and structure files are opened does not matter. Associations are reported in the status area near the bottom of the sequence window and the Chimera Reply Log. A structure (even if it has multiple chains) cannot be associated with more than one sequence, but a single sequence can be associated with more than one structure. If more than one sequence matches a given structure chain, the single best-matching sequence is associated. Sequence-structure association may create new regions. If all residues of a sequence are matched, no region is created. Otherwise, regions are created containing the matched segment(s), any mismatches, and any gaps in the structure relative to the sequence. The region names report the associated structure chain and the number of gaps or mismatches. The initial colors and display status (shown or hidden) of these regions can be controlled in the Regions preferences. Associations can be changed or added using Structure... Associations in the Multalign Viewer menu. The resulting dialog lists the molecule models open in Chimera. An association is specified by choosing a chain (if the model has more than one chain) and the name of the sequence to associate with that chain. 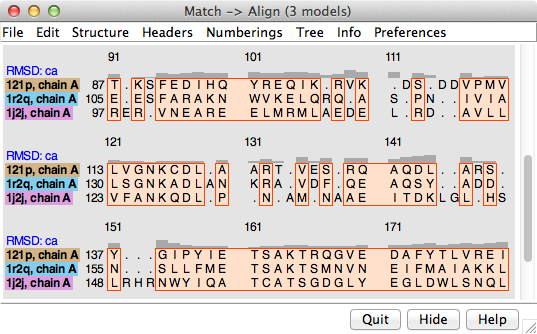 The choices for association include the sequences in the alignment displayed by Multalign Viewer and none. When the setting is none, there is an option to associate with best match, i.e. to compare the structure chain with all of the sequences in the alignment and associate it with the one that yields the fewest mismatches. For the first submodel in an ensemble of structures (multiple submodels with the same primary model number, such as from NMR), there will be an additional button to Propagate its association setting to all of the other submodels in the ensemble. This facilitates associating the whole ensemble with the same sequence for purposes of superposition and/or calculating RMSD headers. Associations will be made as specified, no matter how inappropriate. Apply performs the associations without dismissing the panel, while OK performs the associations and dismisses the panel. Close dismisses the panel without changing the associations. Help opens this manual page in a browser window. Structure... Load Structures in the Multalign Viewer menu can be used to open structure files corresponding to sequences that are not already structure-associated. The corresponding structure files are determined from the sequence names using the rules given in the Structure preferences, then retrieved and opened (as described for Fetch by ID). If Automatically load Structures is turned on (also in the Structure preferences), this will occur as soon as an alignment is read. In sequences associated with structures, regions named structure helices (pale yellow with gold outline) and structure strands (pale green with darker outline) can be shown/hidden with the Multalign Viewer menu setting Structure... Secondary Structure... show actual. This setting is initially turned on for individual sequences displayed with the Sequence tool. In sequences not associated with structures, regions named predicted helices (gold outline) and predicted strands (green outline) can be shown/hidden with the Multalign Viewer menu setting Structure... Secondary Structure... show predicted. The prediction is done with GOR. mavPercentConserved - the value for a residue is the percent conservation of the most prevalent residue type at the corresponding position in the alignment. Structure residues not associated with residues in the sequence alignment are not assigned attribute values. Structure... Select (or Render) by Conservation in the Multalign Viewer menu opens the corresponding portion of Render/Select by Attribute, set to the residue attribute mavConservation if numerical, otherwise mavPercentConserved. Numerical attributes will appear in the attribute lists of Render/Select by Attribute; character attributes will be listed only Select by Attribute portion. It may be necessary to Refresh the attribute menus or values in these tools to update them with any changes in Multalign Viewer header information. Note: if a structure is associated with more than one alignment, the attribute values are based on the alignment for which association occurred or changed most recently. Generally this is the alignment most recently created or opened, but a different alignment can be forced as the “winner” by choosing Structure... Associations from its menu and toggling an existing association to none and then back (each time clicking Apply). Structure... Match in the Multalign Viewer menu allows structures to be superimposed based on the alignment of their associated sequences. The dialog contains two subpanels, each listing the structures associated with sequences in the alignment. One reference structure should be chosen in the left side, but any number of structures to be matched (superimposed) with it can be chosen in the right side. Residues in each Structure to match are paired with the aligned (in the sequence alignment) residues of the Reference structure. If both structures are associated with the same sequence, the correspondence is even more obvious. Fitting uses one point per residue: CA in amino acid residues and C4' in nucleic acid residues. If a nucleic acid residue lacks a C4' atom (some lower-resolution structures are P traces), its P atom will be paired with the P atom of the aligned residue. The number of atom pairs fitted and the resulting RMSD are reported in the Chimera Reply Log and the status area near the bottom of the sequence window. Match highly conserved residues only causes only the well-conserved (at least 80%) positions in the alignment to be used for the least-squares fit. These are the positions shown as capital letters in the consensus sequence. Match active region only causes only the positions in the current active region of the alignment to be used for matching. Use pseudobonds to show matched atoms indicates that lines (pseudobonds) should be drawn between the matched atoms. For each matched pair of structures, a pseudobond group is created and colored uniquely (in order, the named colors dark green, dodger blue, sienna, yellow, spring green, purple, gray, and coral are used). Each group is named matches of..., where the rest of the name indicates the structures and chains that were matched. The PseudoBond Panel can be used to change the appearance of or delete the pseudobonds. Iterate by pruning long atom pairs until no pair exceeds [x] angstroms refers to an iterative fitting procedure: in each cycle, atom pairs are removed from the match list and the remaining pairs are fitted, until no matched pair is more than x apart (default 2.0 Å). The atom pairs removed are either the 10% farthest apart of all pairs or the 50% farthest apart of all pairs exceeding the cutoff, whichever is the lesser number of pairs. The result is that the best-matching “core” regions are maximally superimposed; conformationally dissimilar regions such as flexible loops are not included in the final fit, even though they may be aligned in the sequence alignment. 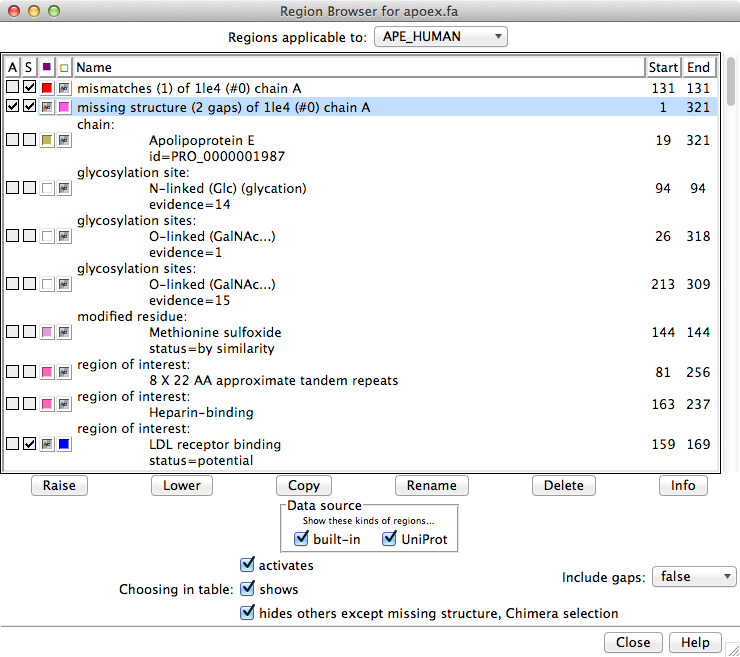 Create region showing matched residues indicates that the residues paired to generate the final fit should be shown as a region named matched residues. The spatial variation among multiple superimposed structures can be shown and analyzed using one or more of the RMSD headers and corresponding residue attributes (mavRMSDca, mavRMSDbackbone, and mavRMSDfull). All of the structure residues associated with a column in the alignment are assigned the same value of a given attribute. An overall RMSD value is calculated for each region in which a block encloses at least one column associated with at least two structure residues. All pairwise within-column distances are included in the calculation of the overall RMSD, and all distances are weighted equally (columns may not be weighted equally, as they may be associated with differing numbers of structure residues). The current overall RMSD for a region is reported at the bottom of the sequence window and in the Reply Log as the region is created, and values that are updated as needed are shown in the RMSD column of the Region Browser. Pairwise assessments of spatial variation can be performed by choosing Structure... Assess Match from the Multalign Viewer menu. Each pairwise comparison creates an attribute of the residues of one structure containing the distances from the sequence-aligned residues of a reference structure. A Reference structure should be chosen from the pulldown menu of structures associated with sequences in the alignment. One or more Structures to evaluate should be chosen from the list of remaining structures. The structures should already be superimposed, but the superposition can have been generated in any way, including manually (not necessarily using Structure... Match). One point per residue is used for the comparison. The distance between each reference-evaluation pair of residues aligned in the sequence alignment (or corresponding to the same residue, if the reference and evaluation structures are associated with the same sequence) is measured. The distances are assigned as a residue attribute of the evaluation structure(s), named matchDist by default. After attribute values have been assigned, Select by Attribute will appear, set to the new residue attribute. OK performs the comparison and dismisses the dialog, while Close just dismisses the dialog. Help opens this manual page in a browser window. 1 An alignment from Blast is only a pseudo-multiple alignment, a consolidation of the pairwise alignments of individual hits to the query. Since alignment quality is important for comparative modeling, it may be helpful to realign the sequences with true multiple-alignment software (Edit... Realign Sequences in the Multalign Viewer menu) before modeling. Further, Blast may omit parts of the sequences of hit structures. To generate a multiple alignment containing the entire sequences, load the structures of the Blast hits of interest, then proceed as described above for starting with a structure. 2 Before comparative modeling with multiple templates fetched by mda, use the command reset overlay to position the template structures for best results. Building parts of a protein without using a template. The interface is shown by choosing Structure... Modeller (loops/refinement) from the Multalign Viewer menu. Missing segments can be built de novo, or existing segments refined by generating additional possible conformations. Parts that need building or refinement are often (but not always) loops between secondary structure elements. The Preferences section of the Multalign Viewer menu controls preferences specific to Multalign Viewer. Settings are saved to the Chimera preferences file as soon as they are changed. Close dismisses the Multalign Viewer preferences tool, and Help opens this manual page in a browser window. Note that a typed-in value will not be applied until Apply, OK (which also dismisses the preferences tool), or the Enter (return) key has been pressed. Changes in other types of settings take effect and are saved immediately. The Appearance section of the Multalign Viewer preferences controls sequence text arrangement and coloring. Most of the preferences in this section can be set separately for Multiple alignments and Single sequences. ribbon - color one-letter codes to match the associated structure residues, the average color where multiple structures are associated, and black where no structures are associated; ribbons will match the lettering, but need not be displayed for this option to work. Possible uses include making the letters match a structure that has been colored by attribute, by domain, or over a rainbow range of hues. The Structure section of the Multalign Viewer preferences sets rules for automatic sequence-structure association and structure loading. Structure loading - whether/how sequence names relate to the names of the corresponding structure files; whether to retrieve and open such files (as described for Fetch by ID) as soon as a sequence alignment is read. No more than one structure per sequence will be loaded. If a sequence name corresponds to both a SCOP file and a PDB file, the SCOP file will be loaded (unless the Load SCOP... option is turned off). These correspondence rules are not mutually exclusive; all but the last are on by default. The Headers section of the Multalign Viewer preferences controls how alignment headers are calculated and whether alignment numbering is shown initially. Consensus style (majority in column including gaps/majority in column ignoring gaps) - what to show in the header line named Consensus. The consensus sequence shows the residue type most prevalent (not necessarily >50%) at each position in the alignment; highly conserved residues (80% or greater) are capitalized and shown in purple, except that the completely conserved residues are shown in red. If several residue types are equally the most prevalent, one is chosen at random to appear in the consensus sequence. When gaps are included, however, the consensus will show a gap at positions where a gap is the most prevalent or equally the most prevalent as one or more residue types. Conservation style (AL2CO/Clustal histogram/Clustal characters/identity histogram) - what to show in the header line named Conservation and assign as the mavConservation attribute of residues in associated structures. The values can be saved to a file. In a Clustal histogram, full bar height indicates complete identity, 2/3 bar height indicates Clustal strong group conservation, and 1/3 bar height indicates Clustal weak group conservation. Clustal characters are the characters used in Clustal format to indicate conservation: "*" for complete identity, ":" for strong group conservation, and "." for weak group conservation. An identity histogram shows what proportion of the sequences have the most prevalent nongap character per alignment column. Histogram bar heights are proportional to (M-1)/(N-1), where M is the number of occurrences of the most prevalent residue type at a position in the alignment and N is the number of sequences in the alignment. Thus, if every sequence has a different residue at a given position, the bar height is zero, not 1/N. However, M/N values (not the values used for display purposes) are used for the mavConservation attribute and written out when conservation values are saved. AL2CO: calculation of positional conservation in a protein sequence alignment. Pei J, Grishin NV. Bioinformatics. 2001 Aug;17(8):700-12. Averaging window (default 1) - window width, or how many alignment positions to average in a sliding window. The result is assigned to the central column of the window when the width is odd, the column left of center when the width is even (e.g., the fourth position in a window of 8), with various adjustments at the termini. The authors of AL2CO recommend a width of 3 for motif analyses. Conservation values from AL2CO are in standard deviations from the mean (sometimes called Z-scores) and can range from –∞ (least conserved) to +∞ (most conserved). The Regions section of the Multalign Viewer preferences controls whether a selection will be shown as a region and sets initial region colors. If the alignment is wrapped (or would wrap if it were longer), one EPS file will be saved with the specified name. Otherwise, the sequence names and alignment will be saved in two separate EPS files with "-names" and "-alignment" appended to the specified name (before the ".eps" suffix, if present). Load Color Scheme... read a parameter file to set the coloring of residue codes in the sequence window. When a scheme is loaded, the residue codes are colored accordingly and the name of the custom coloring file is added to the list of choices for Residue letter coloring in the Appearance preferences. The dialog for loading the file includes an option to Make this scheme the default. The location of each custom coloring file is saved in the preferences file. If a custom coloring file is later renamed, moved, or deleted, trying to load the corresponding scheme will generate an error. Note: when the mouse focus is in the sequence window, the system “copy” shortcut (for example, command-C on Mac) will copy the contents of the active region, if any, otherwise the entire sequence(s), into the text buffer. Multiple sequences or their parts will be separated by newlines. Reorder Sequences - open a dialog for reordering sequences. The dialog lists the names of the sequences in their current order. The order can be changed by clicking on a name and moving it to the top, bottom, one higher, or one lower. Any order can be achieved through combinations of these operations. OK and Apply perform the reordering in the sequence window with and without dismissing the dialog, respectively. Sequence reordering will delete multisequence regions, although the Chimera selection region (if any) will subsequently reappear. Insert All-Gap Columns - open a dialog for inserting all-gap columns into the alignment (presumably to facilitate subsequent editing that moves residues into the new space). The dialog allows specification of how many gap columns to add, where to insert them, and the character to use for gap positions. OK and Apply insert the gap columns with and without dismissing the dialog, respectively. Delete Sequences/Gaps... open a dialog for deleting sequences and/or all-gap columns. One or more sequences can be slated for deletion by choosing their names from the list. Ctrl-click toggles the status of a sequence. To choose a block of sequences without dragging, click on the first (or last) and then Shift-click on the last (or first) in the desired block. Delete all-gap columns indicates that columns containing only gaps (evaluated after sequence deletion, if any) should be removed. Clicking Apply (or OK, which also closes the dialog) performs the indicated deletions. Add Sequence - open a dialog for adding a new sequence to the alignment. The existing alignment will not be changed, except that gaps may be inserted between its columns. Unless simply appended as described below, a new sequence will be added to the alignment using the Needleman-Wunsch algorithm and the indicated scoring parameters as applied to All sequences or only the Specified sequences. Either way, the result will include all sequences, but sometimes a better alignment can be obtained by omitting hard-to-align sequences (those not similar to the new sequence) from the scoring calculations. Clicking Apply (or OK, which also closes the dialog) adds the sequence to the alignment. Plain Text - add a sequence that has been entered or pasted in the Sequence field as plain text. It will be converted to upper case and any spaces removed automatically. The sequence should not contain gap characters, unless (with gaps) it is exactly the same length as the existing alignment and the option to Simply append... is used. A single sequence or multiple unaligned sequences (no gap characters) can be read from a file in FASTA or NBRF/PIR format. The sequences do not need to be of equal length; they will be added one by one in their order of occurrence in the file, each addition leaving the preceding alignment unchanged except by the possible insertion of gap columns. An alignment (possibly containing gap characters) in any of the known formats can be appended if it is exactly the same length as the existing alignment and the option to Simply append... is used. From UniProt - add a sequence from UniProt and assign its feature annotations as regions (much as described for PDB/UniProt Info, except independent of structure). UniProt's ID mapping service can be used to obtain UniProt identifiers from other sequence database identifiers. Matrix (default BLOSUM-62) - substitution matrix for scoring the alignment. The score for aligning a residue in the new sequence with a column in the existing alignment is the sum of the matrix values for the residue versus each of the residues in the column (and zero versus a gap position) divided by the number of sequences (rows) in the existing alignment. This contribution over the entire alignment is the residue similarity score. In some cases there will also be a secondary structure score. Opening penalty (default 12) - penalty for opening a gap in the existing alignment, regardless of whether it is already flanked by gaps in any of the sequences. For opening a gap in the new sequence, this penalty is scaled by the fraction of sequences in the existing alignment not gapped at that position. When secondary structure scoring is used, secondary-structure-specific gap opening penalties apply instead. Extension penalty (default 1) - penalty for extending a gap between columns of the existing alignment. For extending a gap in the new sequence, this penalty is scaled by the fraction of sequences in the existing alignment not gapped at that position. The alignment parameter values last used for adding a sequence are retained. However, Reset... buttons are provided for restoring the general alignment parameters (those other than secondary structure scoring) and secondary structure scoring parameters to their factory defaults. Find Sequence Name... find sequences whose names contain or exactly match an entered string, where capitalization is important. Clicking Find shows a matching sequence name in red and scrolls the alignment vertically to center on it. 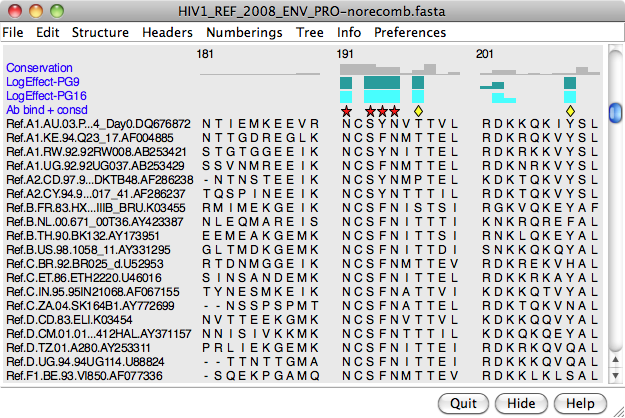 The sequence's position in the alignment (#N of M) and number of residues is reported near the bottom of the sequence window. If there are multiple matches, clicking Find again locates the next one. show actual - whether to show regions named structure helices (pale yellow with gold outline) and structure strands (pale green with darker outline) in sequences with associated structures. Protein helix and strand assignments are taken from the input structure file or generated with ksdssp. show predicted - whether to show regions named predicted helices (gold outline) and predicted strands (green outline) in sequences without associated structures. Helices and strands in these sequences are predicted using GOR. Save... save a header definition file containing alignment positions and header values. Header values are the characters or numbers (shown with bar heights in a histogram) in a header line such as Conservation in the sequence window. No-value positions (for example, when the AL2CO Conservation style is used, positions with a gap in more than gap fraction of the sequences) can be omitted from the file. Adjust Sequence Numberings... open a dialog for specifying sequence start numbers. One or more sequences can be chosen with the mouse. Ctrl-click toggles the status of a sequence. To choose a block of sequences without dragging, click on the first (or last) and then Shift-click on the last (or first) in the desired block. Clicking Apply (or OK, which also closes the dialog) applies the new Start number to the chosen sequence(s). UniProt/CDD Annotations... map feature annotations from UniProt or the Conserved Domain Database (CDD) onto a sequence as regions; if the matching database entry lacks feature annotations, or no match is found, no regions will be generated. from PDB code and chain ID - using the same lookup mechanism as the PDB/UniProt Info tool. Namely, structure annotations and any PDB-UniProt mapping information (UniProt ID and residue number correspondences) are fetched from the RCSB PDB. The UniProt ID is reported in the Reply Log. by Blast search of UniProt (may take minutes) - UniRef100 is BLAST-searched for sequences similar to the query; this may take several minutes and is handled as a background task. Only the top hit is used, regardless of the quality or presence of feature annotations. The UniProt ID and E-value of the top hit are given in the Reply Log. The top hit may not be identical to the query sequence, and scientific judgement must be exercised as to the transferability of any annotations. Possible actions are to annotate the sequence with the UniProt sequence features and/or show the corresponding UniProt web page(s). CDD annotations are obtained by scanning the query sequence against the position-specific score matrices (PSSMs) in the CDD default database, which includes NCBI-curated domains and data imported from Pfam, SMART, COG, PRK, and TIGRFAM (as in CD-search). This may take several minutes and is handled as a background task. Only the top hit per sequence portion is used as a source of annotations, providing it meets the E-value criterion of 0.01. The ID of the hit PSSM (representing a conserved domain) is reported in the Reply Log, and the Also show... option indicates whether to open the corresponding CDD web page. Scientific judgement must be exercised as to the transferability of any annotations. The CDD info button opens the general help page at the CDD website. In the Region Browser, the initial ordering of annotations from either database is alphabetical, right after any missing structure region. If annotations are obtained from both sources, all annotations from the later-used source will be listed above all annotations from the source used earlier.